Apparently this week’s milder temperatures came at the price of very high winds over the weekend here in Horton. Aside from some clutter in the bee yard however, all seems well, as was evidenced by a flurry of cleansing flights during yesterday’s marvelous sun breaks. I am the renegade beekeeper who does not put heavy blocks on top of bee hives. 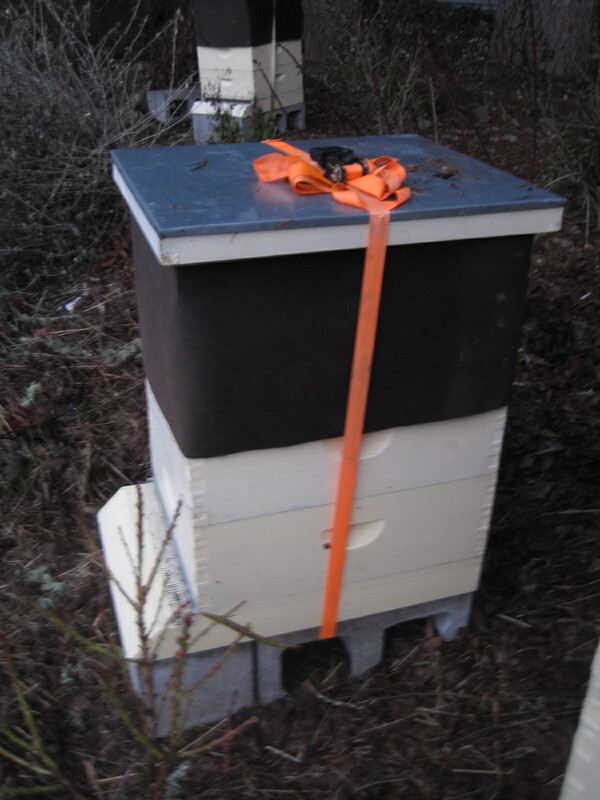 I find it much more convenient to secure hives to their concrete block stands with ratchet straps. Fifteen-foot straps (sold inexpensively at Harbor Freight) are quite adequate to wrap through the holes of a concrete block stand and around as many hive bodies as I can reach. While this set-up would do little to deter a bear, so far it has been sufficient to keep both wind and small animals at bay.